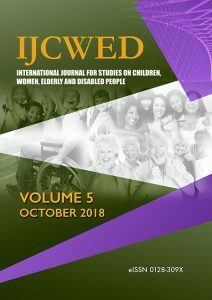 International Journal for Studies on Children, Women, Elderly and Disabled People (IJCWED eISSN 0128-309X) is peer-reviewed and published semi-annually in January and June every year. The journal accepts contributions in English and Malay only. IJCWED is providing scholars the best in theory, research, and methodology as well as providing platform to professionals and academics to share their ideas, knowledge and findings. The main objective of this journal is to provide a channel for the publication of articles based on original research as well as commentaries on a range of areas children, women, elderly and disabled people. Other related issues including violence, neglect, poverty, arm conflicts, forced migration and displacement, sexual abuse, disparity in education, socio economics discrimination and health issues also accepted in the journal. IJCWED publishes original papers, review papers, conceptual framework, analytical and simulation models, case studies, empirical research, technical notes, and book reviews.